The latest and final issue of KeroKero Ace magazine is now out, bringing with it our monthly spoilers for Cardfight!! 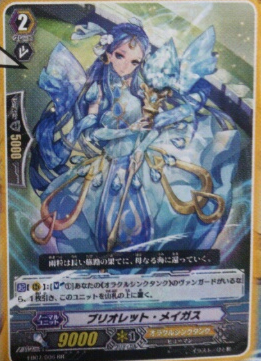 Vanguard, this time focusing on VG-EB07: Mystical Magus and VG-BT13: Catastrophic Outbreak. 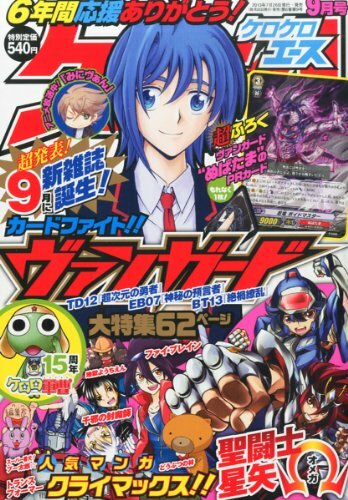 It was revealed just yesterday morning that KKA will be ceasing publication following this issue, and to cope with that Bushiroad Inc. will be publishing its own monthly magazine starting in September, Monthly Bushiroad. To commemorate the return of the long-awaited Nubatama ninja clan that will be finally completed after a twelve-set hiatus spread out over two years, this issue is being released with a promo print of Stealth Dragon, Voidmaster, Nubatama's first boss card. Translations of the issue's key cards are below. Most of these were translated by NeoArkadia and FelGrand. Pentagonal Magus was translated by winterhurtz. 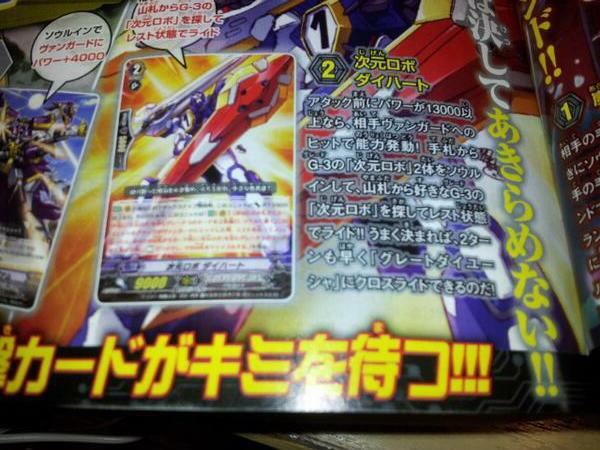 7/25/2013 Edit: Nubatama translations revised. Kujikirikongou has the opponent choose the cards to discard and bind. AUTO: [Limit Break 4] When another <<Oracle Think Tank>> rides on this unit, look at the top 3 cards of your deck, select one of the cards within and add it to your hand, then return the remaining card(s) to the top of your deck. During this turn, your Vanguard gains Power +10000. 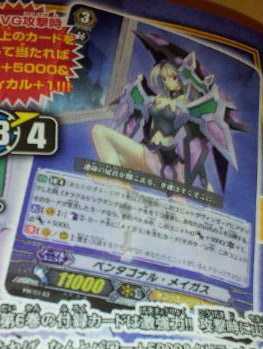 CONT [V]: During your turn, if you have 4 or more cards in your hand, this unit gets [Power]+2000. 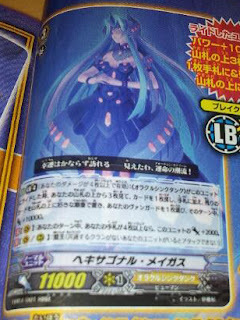 AUTO: [Limit Break 4] When this unit attacks the Vanguard, you can declare the name of 1 "Oracle Think Tank" unit and reveal the Top Card of your Deck. 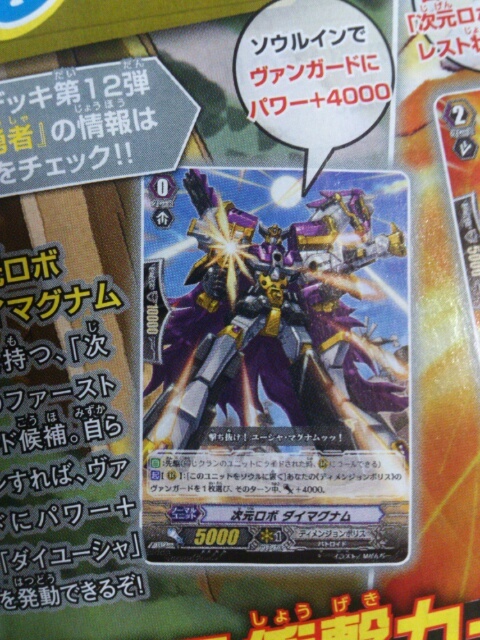 If the name of the revealed card matches the name you declared, during this battle, this unit gets Power +5000/Critical +1. 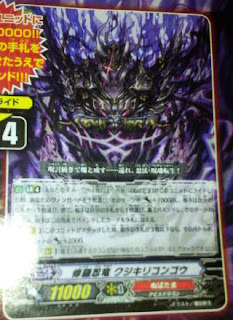 ACT [V]: [Counterblast 1 "Magus"] Until the end of the turn, this unit gets Power +5000. 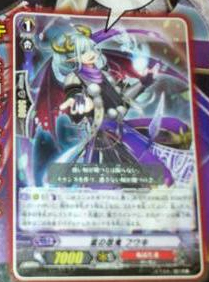 Note: Pentagonal Magus will be a promo card released with volume 6 of the Cardfight!! Vanguard manga, and an RR print in VG-EB07: Mystical Magus. AUTO [R]: When this unit boosts an <<Oracle Think Tank>>, you may declare a name of an <<Oracle Think Tank>>. Reveal the top card of your deck, and if it's the card that you have declared, during this battle, the boosted unit gains +3000. 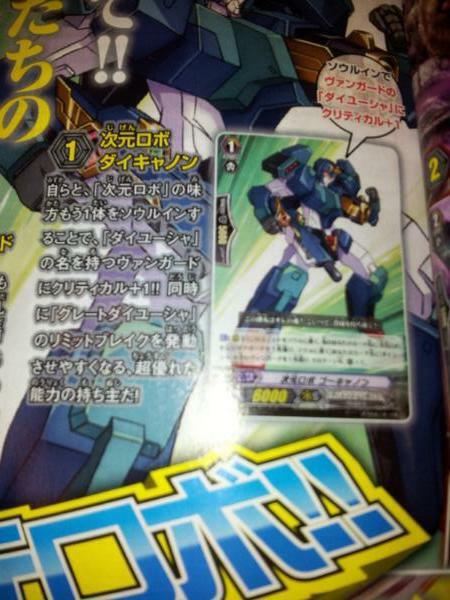 AUTO [V/R]: [Counterblast 1] When this unit attacks, and you have a <<Oracle Think Tank>> Vanguard, you may pay the cost. If you do, declare a name of an <<Oracle Think Tank>>, and reveal the top card of your deck. If the card revealed is the declared card, you may add it to your hand, if not, return that card to the top of your deck and choose one card in your damage zone and turn it face-up. 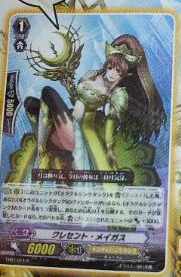 ACT [R]: [Soulblast 1] If you have an Oracle Think Tank vanguard, draw one card, and put this unit on the top of your deck. 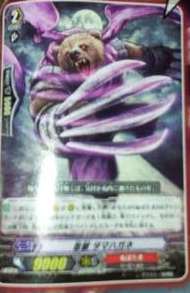 AUTO [Limit Break 4]: When a <<Nubatama>> Rides this Unit, choose 1 of your Vanguards, it gains 10000 Power, then your opponent chooses 1 card in their hand, discards it, then your opponent selects 1 card in their hand, they Bind it face-down, then when at the beginning of the End of this turn, your opponent adds the Bound card to their hand. AUTO [V]: When this Unit attacks, if your opponent has 3 or less cards in their hand, this Unit gains 2000 Power during this battle. 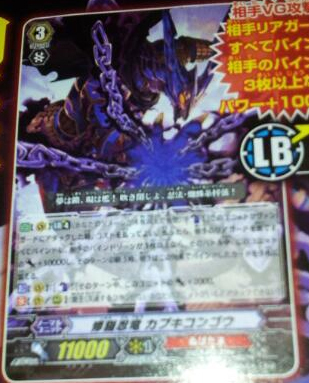 AUTO [V] [Limit Break 4]: [Counterblast 1] When this unit attacks the opponent's Vanguard, you may pay the cost. If you do, Bind all your opponent's Rearguards face-down. If you bind 3 or more Units, this Unit gets Power +10000 during this battle. During the end of that turn, your opponent returns all the Bound Units to their hand. ACT [V]: [Counterblast 1] This Unit gains Power +2000 during this turn. 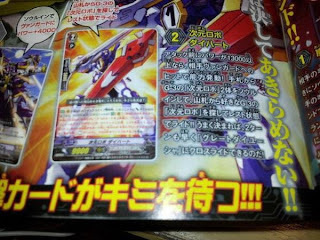 AUTO [R]: [Soul Blast 1] When an attack hits the Vanguard that this Unit boosted, you can select 2 cards in your opponent's Bind Zone and discard them. AUTO [R]: [Counterblast 1, Place this Unit in the Soul] If your opponent has 3 or more cards in their hand, you can choose one of them at random and Bind it face-down. During the End of this turn, return the Bound Card to the opponent's hand. AUTO: When this Unit appears in a Vanguard/Rearguard Circle, you can choose 1 of your opponent's Rearguards, Bind it. During the end of the turn, the Bound Card is returned to the opponent's hand. 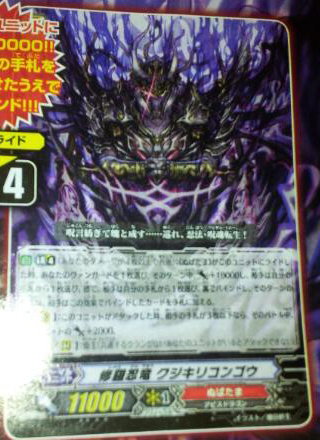 ACT [R]: [Place this Unit in your Soul] Select 1 of your <<Dimension Police>> Vanguards, it gains 4000 Power during this turn. 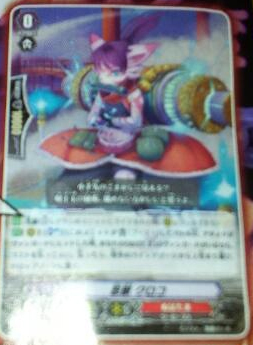 ACT: (Rearguard Circle) [Put this card into your soul, and choose one of your "Dimensional Robo" rearguards and put it into your soul] Choose your vanguard with "Daiyuusha" in its name, and it gets Critical +1 until the end of the turn. 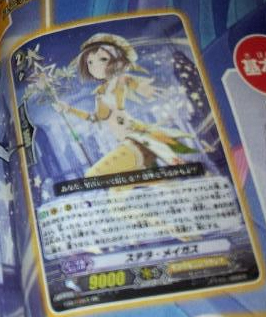 AUTO [V]: At the start of the attack step when this unit attacks, if it has 13000 Power or more, this unit gets: "AUTO [V]: [Select 2 Grade 3 "Dimensional Robo" units from your hand, and place them into the Soul] When this unit's attack hits the Vanguard, you may pay the cost. If you do, search your deck for a Grade 3 "Dimensional Robo" unit, and ride it in <<Rest>> Position. Then, shuffle your deck." until the end of the battle.